Miltonia orchids, often confused with the related Miltoniopsis (or Pansy Orchid) are very showy plants from the Oncidium alliance with large, flat, showy flowers. They are often used in hybridization. The plants have a flattened pseudobulb with thin leaves emerging both from its top and its base. 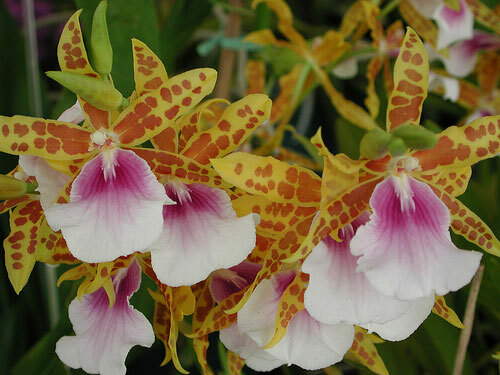 They originate in South America, mostly in Brazil, and grow as epiphytes. There are eight naturally-occuring hybrids within the genus and nine actual species, so they hybridize regularly in the wild! The genus has been known since 1837 when John Lindley named Milt. spectabilis. They are all fragrant orchids. When they bloom, one or two flower spikes will come from the base of each growth, each yielding several large flowers. The rhizomes branch frequently, so they can quickly form large specimens that produce many flower spikes at a time. They don't like to dry out. The leaves usually have a single fold running down the middle; if you see other folds and wrinkles, it's being deprived of water, either from underwatering or root rot from overwatering (in which case the orchid should be repotted.) Water as they approach dryness, and use a relatively fine, absorbent potting mix such as New Zealand sphagnum moss, rockwool, or fine-grade fir bark. Lighting can be relatively low, 1000-2000 footcandles, such as an East or West window. They don't need any more light than a Phalaenopsis. Humidity should be 50-70%, if possible. They aren't very finicky about it if they're being watered enough. They grow best at intermediate temperatures, 70-80°F by day (21-26C), dropping 10-15° (6-8C) at night. With proper care, plants will grow rapidly, roughly doubling the number of leads (and hence, flowers) every year. So you can quickly get a very impressive specimen.